On our last visit to my husband's hometown in Rajasthani, India. My father in law brought this super delicious puffed pastry from the renowned local stall for us to have as breakfast. Hubby and I fell in love with this pastry right away, it tasted even better being dipped in the spicy Rajasthani curry -- Kadhi. We had it almost daily during our two weeks stay! Yupp, that is how tasty it is! 1. Mix urad and moong dal together, wash and soak for 20 minutes. 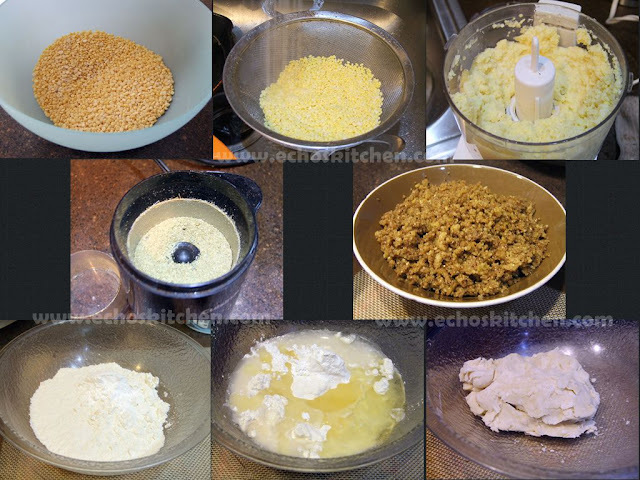 Grind the mixed dal coarsely in a food processor. 2. Grind the coriander and fennel seeds into powder using a mill or coffee grinder. 3. Heat up 2 tbsp of ghee + 1 tbsp of oil in a cooking utensil, stir fry the dal and all of the spices until it is cooked, loosen it using a spatula. Let the dal cool to room temperature. 4. Knead the flours, salt and oil together using icy water, add water slowly. As soon as the dough is holding together, stop kneading. Do not over knead the dough. Cover the dough with clean cloth and let it sit for 10-15 minutes. 5. Divide dough into 15 equal parts, roll it out and press the edges to make a disc that is thicker in the center. 6. Place 1 tsp of filling in the center of the disc, wrap and pleat to form a bun with flowery seems on top. Work through all the dough with the same process. 7. Place the kachoris on a nonstick surface with the seams facing down. 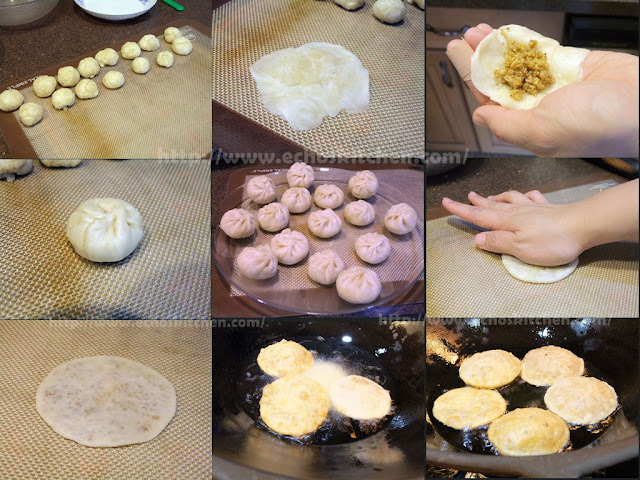 Using your palm to slowly flatten the kachoris to form a 3 inches disc. Note: Do not use rolling pin to flatten the kachoris at this step, as the pressure from rolling pin will be too much and will cause breakage in the disc, which will then make very oily and flat kachoris. 8. 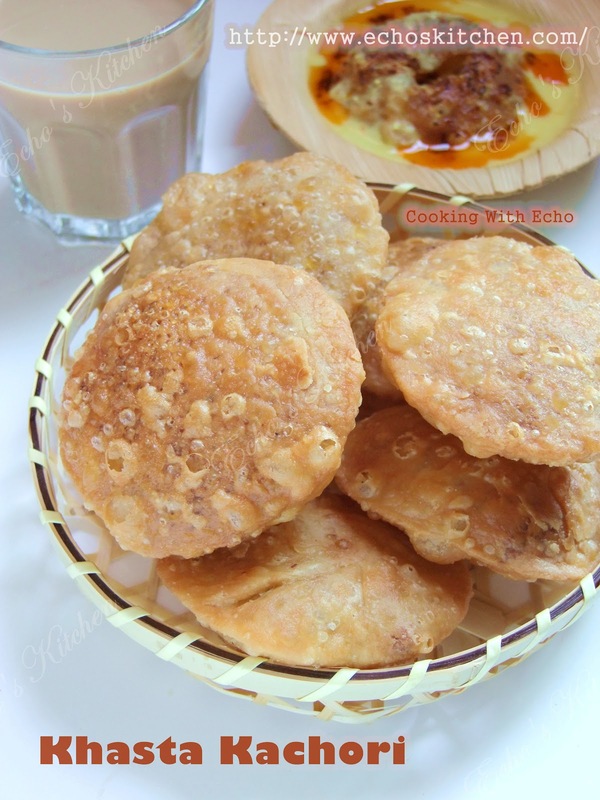 Heat up 2-3 inches of oil in a cooking wok, fry few kachoris at a time at medium to low heat until both sides turn golden brown in color, turn sides a few times in between. It should take about 5-6 minutes to fry one batch. 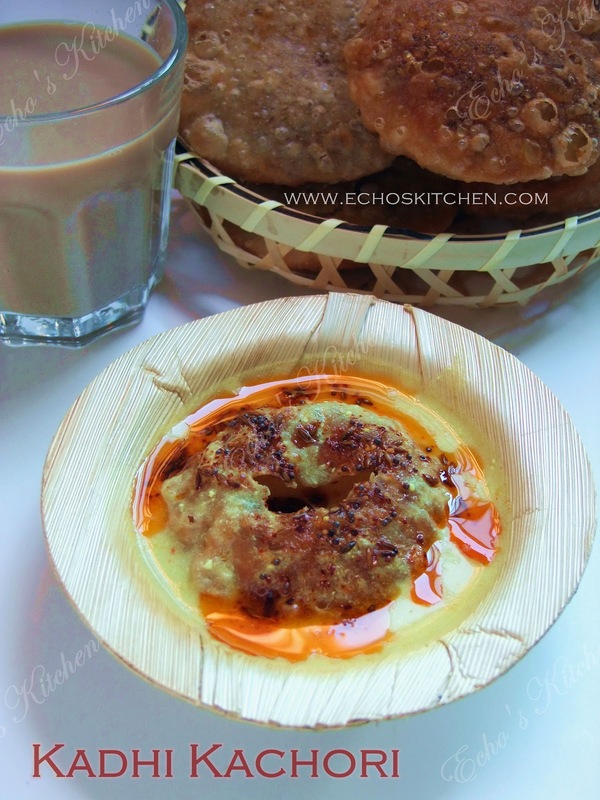 You can serve the Kachoris as it is with tea, or with some chutneys of your choice. The Rajasthani though like to serve theirs with the state's' famous Kadhi. The spicy curry compliments the crispiness of kachori.